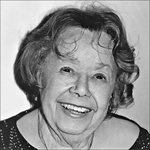 Obituary for Janice Smith Eason | McGuire Funeral Service, Inc.
Janice Smith Eason, 98, of Washington, DC, passed peacefully at her home. Janice was the beloved wife of the late Capt. John C. Eason, Jr. She is survived by her devoted nieces, Ivora Jones Tyler (Charles) and Janice Jones Hylton (William); great-nieces, Ashley Hylton and Lauren Tyler; great-great-nephew, Jace Nance; other relatives and friends. She was preceded in death by her adored great-nephew, Roger G. Thurston, IV.